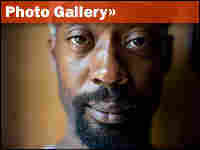 Homeless Advocate Goes High Tech Eric Sheptock is a homeless advocate in Washington, D.C. Though he's homeless himself, he keeps a blog, a Facebook page and a Twitter account — platforms to help educate the public about what he and many others like him are up against. 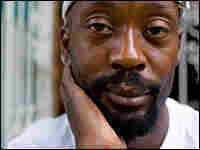 Eric Sheptock, a homeless advocate in Washington, D.C., has been homeless off and on since 1994. Recently, he started a blog about homeless issues in D.C.
Sheptock sings in his choir one Sunday morning. Sheptock listens during a job training session. Homeless advocate Eric Sheptock uses technology to get his message out. Though he's homeless himself, he keeps a blog, a Facebook page and a Twitter account. Sheptock, who lives in Washington, D.C., says he wants to educate the public about what he and many others like him are up against. He spends a lot of time in the city's public libraries, where he gets free access to a computer. There he can check his e-mail account and write his blog — called On the Clock with Eric Sheptock — which has so far attracted hundreds of readers. He recently wrote about his concern that the homeless shelter he now lives in is in danger of closing. "My next blog [post] is going to be about the challenges that homeless people have when it comes to employment because oftentimes they can't get money to ride the bus to the job and they can't get lunch money," Sheptock says. "So for your first week or two, you have a lot of difficulty maintaining that job." He's also written about how hard it is for the homeless to get work in the first place. For example, they might have to carry all their belongings to a job interview, turning off a potential employer. Or they might have to choose between work and food because the soup kitchen closes before the workday ends. Sheptock also has a cell phone. He relies on it to keep in touch with other activists. He recently got a part-time job as a janitor, which helps pay for the phone. Sheptock is 40 years old. You wouldn't guess it by looking at him, but he's been homeless on and off for the past 15 years. He's clean-cut and trim — from so much walking, he says. His advocacy efforts take him all over the city — from blogging at the library to meeting with city officials and other advocates. Sheptock became a homeless activist a couple of years ago during a big fight with the city over the closure of one of D.C.'s largest shelters. 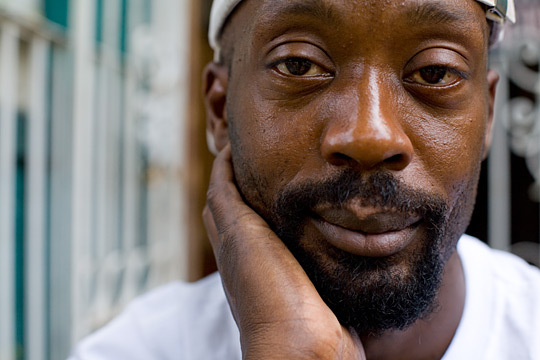 He started writing for Street Sense, a D.C. newspaper devoted to the homeless. And he's working with a production group called Streats TV, which does advocacy for the homeless. Sheptock also spends a lot of time networking. He's trying to mobilize other homeless people to make sure they don't get left high and dry. He has been working with other homeless advocates to try to make sure the city doesn't close shelters before there is someplace else for people to go. But some advocates in the city think he's on the wrong track. They say the city's plan to move the chronically homeless out of shelters and into permanent housing is working and that Sheptock is hurting the cause by fighting to keep the shelters open. And besides, he has other issues he wants to talk about — like stereotypes. He says most people can't tell who is or isn't homeless when they walk down the street. He says many homeless people have mental and substance abuse problems and look the part. But many don't. Some have jobs. And there are more and more families joining the ranks. Most days, Sheptock eats breakfast at Thrive DC, a local nonprofit helping to end homelessness. A woman sitting at his table looks elegant with her flowered dress and heart-shaped earrings. Her name is Angel-Lee Evans, and she became homeless for the first time in February after losing her job. She hopes to get back on her feet soon and return to help the homeless as a volunteer. She says Sheptock is an inspiration. "He is just incredible. He works so hard, and we all just like and respect him so much because he really does care," she says. But it's been a long, tough road for Sheptock. "When I was 8 months old, my parents actually tried to kill me. They beat my head open and left me to die in a motel room. I've got a big scar on the back of my head to prove it," he says, lifting off his baseball cap to reveal a long thin scar on his scalp. Sheptock was in foster care for about five years before he was adopted by a large family in New Jersey. He says he worked for six years after high school but quit in a huff — a "youthful indiscretion," he calls it. That was the start of a downward spiral — years wandering up and down the East Coast, taking odd jobs. He also began to use crack cocaine and spent some time in jail. Sheptock says he's clean now, but his record makes it hard to get work, although he's not even sure he'd take a full-time job if he got one. He says he has too much advocacy work to do. 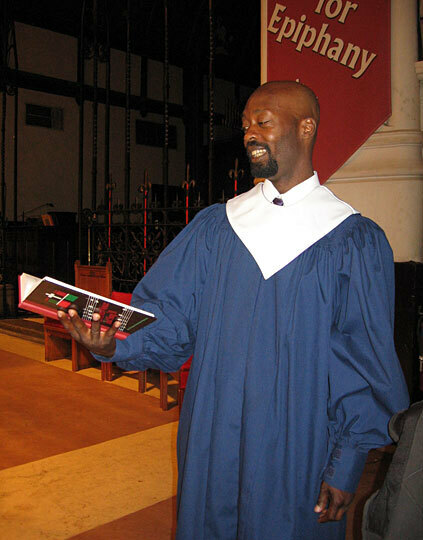 Every Sunday, Sheptock and several other homeless people sing in the choir at the Church of the Epiphany, an Episcopal church in downtown D.C. that ministers to the poor. The rector, Randolph Charles, says Sheptock is an active parishioner. "Talk about authenticity. Talk about speaking with authority," Charles says. 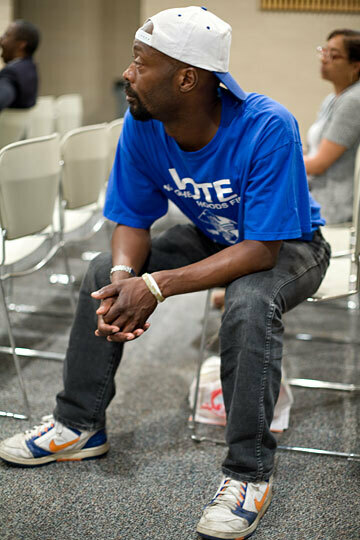 "For someone homeless to advocate for the needs of the homeless, that is so important. And actually, seldom does that happen." He says Sheptock has clearly found his mission in life.